The congregation began services in 1950, and formally organized in 1968. The first building was occupied in 1957. The congregation originated through urbanization from rural Alberta. The building constructed in 1957 was first called Mennonite Fellowship Centre. Epp, Marlene. "Holyrood Mennonite Church (Edmonton, Alberta, Canada)." Global Anabaptist Mennonite Encyclopedia Online. February 1989. Web. 21 Apr 2019. http://gameo.org/index.php?title=Holyrood_Mennonite_Church_(Edmonton,_Alberta,_Canada)&oldid=142475. Epp, Marlene. (February 1989). Holyrood Mennonite Church (Edmonton, Alberta, Canada). Global Anabaptist Mennonite Encyclopedia Online. 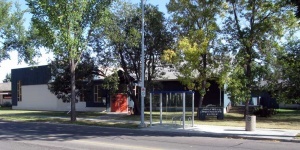 Retrieved 21 April 2019, from http://gameo.org/index.php?title=Holyrood_Mennonite_Church_(Edmonton,_Alberta,_Canada)&oldid=142475.